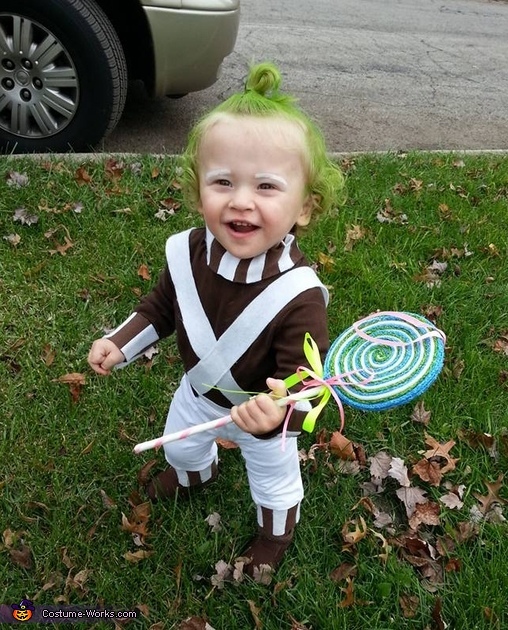 My 19 month old, Toby, is dressed as an Oompa Loompa. This is his 2nd Halloween. I've always loved Willy Wonka. The costume was very cheap and easy to make. I found the shirt, pants, shoes, and socks at a thrift store. The rest is made out of felt. The buttons were from Joanne's. For make-up, we sprayed his hair green and painted his eyebrows white. We spent less than $15 total. This costume was a big hit with children and adults!